the D&D Fishing Charters boat is for you! Our boat is a 24 foot Skagit Orca XLC Extended Cabin. This is our boat’s eighth year out on the water, and it still turns heads. We went all out in providing the ultimate in comfort, the ultimate in proven reliability, as well as the best fish-ability and the highest standards in boat safety for our customers. 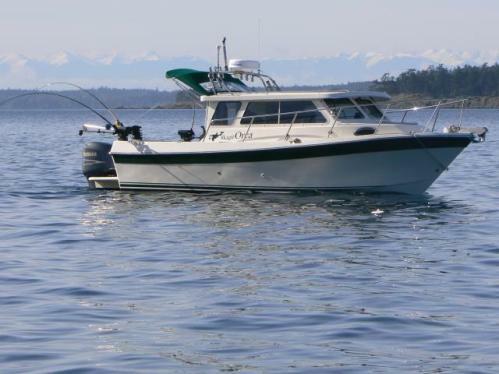 Our boat is the nicest and newest fishing charter vessel operating in Southern Vancouver Island waters. The D&D Fishing Charters boat is powered by an F300 hp Yamaha engine and a T9.9 Yamaha four stroke engine, two of the most environmentally-friendly engines on the market. They are quiet and smoke free. Our power supply will get you to and from the fishing grounds in the quickest time possible because we want you to have more time to get your fishing lines in the water. This increases your chances of catching the big ones. The D&D Fishing Charters boat is solidly built and so well insulated that while we are under power travelling to the fishing grounds, there's no engine noise to interfere with your conversations. The cabin is heated so you do not need any special clothing and has large windows all around for light and ventilation. The galley has a sink, 2 burner stove and a fridge stocked with water, pop and juice. The enclosed stand-up marine head is a 100% private washroom with a flushing toilet. The dinette table provides seating and space for a quick game of cards between bites. And for guests who find they woke up too early, the v-berth is a comfy sleeping area for a quick nap. The D&D Fishing Charters boat comes with all new state-of-the-art marine electronics which includes radar, a large screen full colour commercial grade GPS marine charting system, a commercial grade fish finder and depth sounder sonar, DSC VHF radio, and an MP3 compatible stereo system. With our equipment we get you to the fishing grounds and back to the dock in the thickest fog.